Making pottery is a very complex and rewarding craft, especially when you make your own clay and glazes. Potters take naturally occurring materials and heat them in a kiln to transform them into glass. How cool is that? Most of our glaze materials come to us in their very basic, unprocessed form. They are dug out of the ground, impurities may or may not be removed, they are ground into a fine powder, bagged and shipped to our suppliers. Working with these minerals in their raw state poses some health risks. While most of our materials generally don’t pose an immediate danger such as being explosive or highly corrosive, they can introduce serious long term health problems that can easily be avoided with the proper personal protection. If you’ve never worked with raw glaze materials before and wonder where to begin, this starter kit shopping list will get you on the right track. Respirator- protect your lungs. Be sure to wear a NIOSH approved, fit tested respirator with P100 particulate filters when working with dry materials. Without a respirator, tiny air borne dust particles can enter the lungs and cause irreversible damage over time. You might not be able to see them but they can be deadly. Gloves- protect your hands and arms from coming into contact with raw materials. While some materials are harmless, some can irritate the skin and others contain toxic minerals that can be absorbed into the skin. Don’t risk invisibly poisoning yourself. Safety glasses- protect your eyes. You never know when glaze might splash into your face. Your vision is too important of an asset to risk. Plus, safety glasses make you look fabulously industrial, especially with that snazzy respirator on. Apron- protect your clothes. There’s no sense protecting all of your body parts in the glaze lab, only to walk out, take all of your PPE off and your clothes are still covered in dust to breathe in and share with your friends. Tie your hair back- protect your head. I don’t know about you but my hair is super long and the thought of it getting wrapped around my drill mixer crosses my mind every time I use it. If you have long enough hair to tie back, tie it back. If I’m having an exceptionally long glaze mixing session, I will even tie a bandana on my head so that the dust can stay in the glaze lab and not on my head. Wipe your feet- protect your surroundings. It is good practice to wipe the soles of your shoes after a messy round of mixing so you don’t track dust and raw materials around your studio where they could later be hazardous to yourself and others. An old, damp towel works well to wipe your feet on. Rinse towel at the end of the day and hang to dry. While the risks of working with raw materials may not seem immediate enough or hazardous enough to use all of these safety practices at all times, you have to remember that the damage is being done beyond your level of awareness. You may not feel a physical reaction, but reactions are taking place in the body and the effects can cause a serious impact on your health and your life. I want you to live a long and happy life in your pottery studio. If you love working with raw materials and mixing your own clay and glazes like I do, make sure you are protecting yourself so you can continue to do what you love forever. Do you have anything to add? Let me know how you practice safety in your glaze lab in the comments below. Thanks for the info Sue. Where do you go to get a respirator fit tested? I heard that respirators must be fit tested to be effective and to not be a strain on your cardio-vascular system, and the strain from an improperly used respirator is can be more detrimental in the long term than exposure to silica in a ceramic setting. Do you have some thoughts on this? 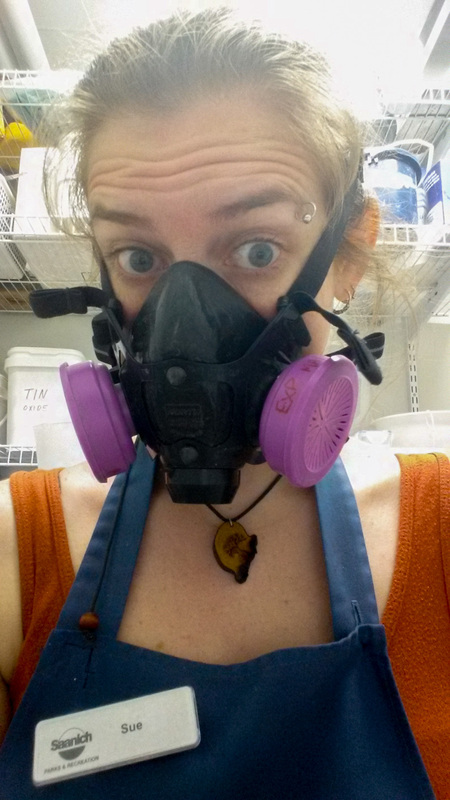 I’m trying to figure out what personal protection I need before I start mixing my own glazes. 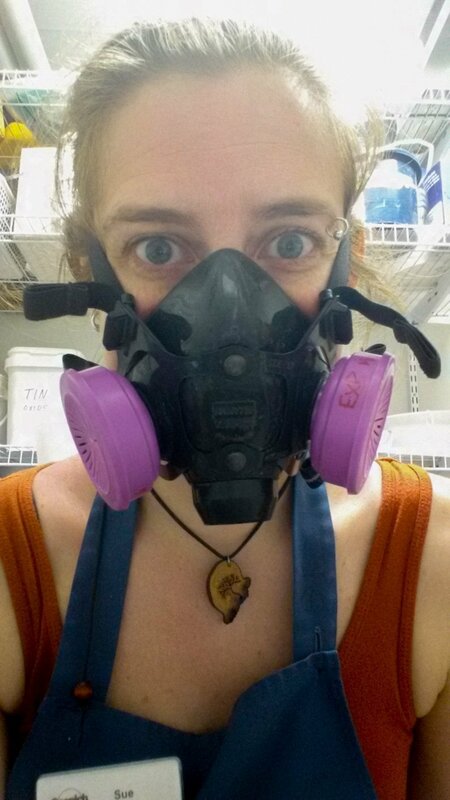 Also, how long do you let the glaze dust in the studio settle before taking off the respirator? Thanks! That’s a very good question. You are right about the importance of fit testing. I work for a municipality and we have a fit testing machine so I’m not sure where you would get it done otherwise. If you find out, please let me know so I can let others know. If the room has no ventilation, I wear my mask while I’m in it for the rest of the day. I plan to end my studio time with respirator activities so I’m not spending a bunch of time in there after. A good practice is to start with water in the bucket already before adding dry materials. I usually start with about 60% of the dry batch weight and then add more water as necessary. This wets the powder right away so it’s can’t float back into the air.